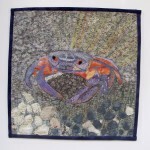 Commissioned quilt for Neil Diamond and his new wife Kathryn: A project from the stars! It’s done! Bound, sewn and delivered. I hope it’s a finalist. It was really fun to do. I tried to bring out the three-dimensional quality of the scene. 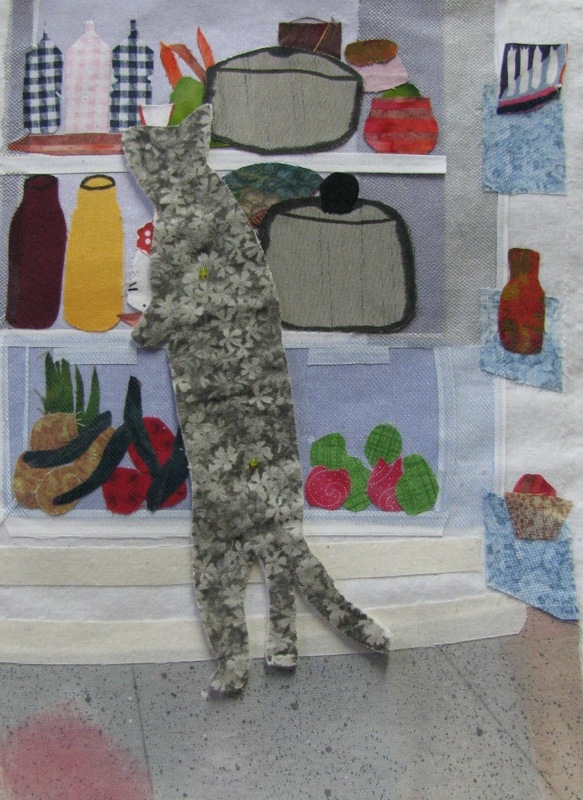 I wanted you, the viewer, to understand that you and a cat are looking at a fridge with lots of stuff on the shelves. 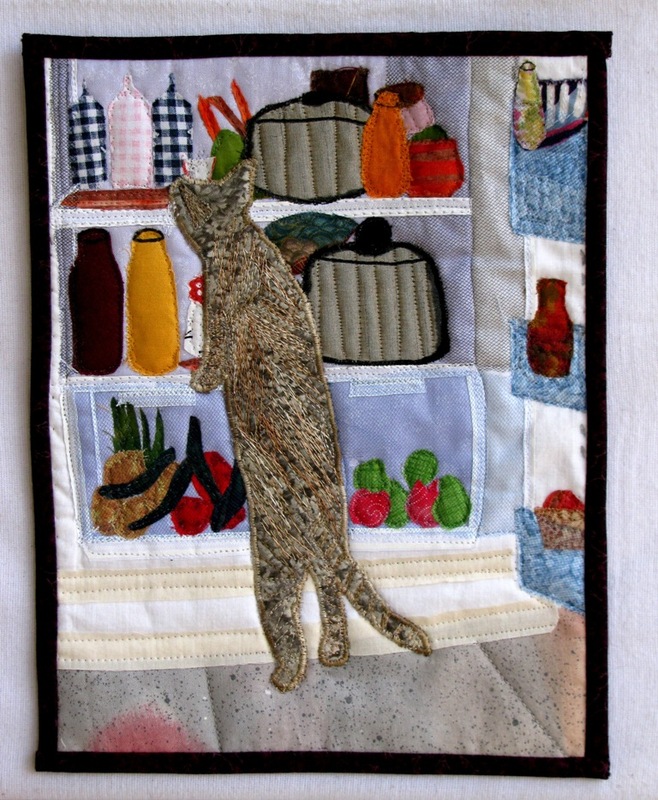 The closeup view shows the cat and her long white whiskers peering and sniffing at the contents of the fridge. The batting is Warm and Natural, cotton batting. The final size is 8.5″ x 11″. 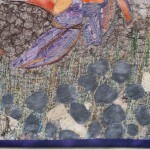 Did I mention I plan to enter this miniature quilt into a challenge? It’s due next week. Quilting Arts Magazine is running the “Greatest Pet Peeve” Reader Challenge”. I thought it would be fun, since I live in a “cat house” and there are more than a few feline antics to choose from. 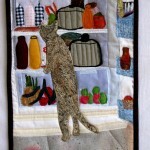 I debated whether a cat in the fridge would be more amusing than a cat drinking from a coffee mug. 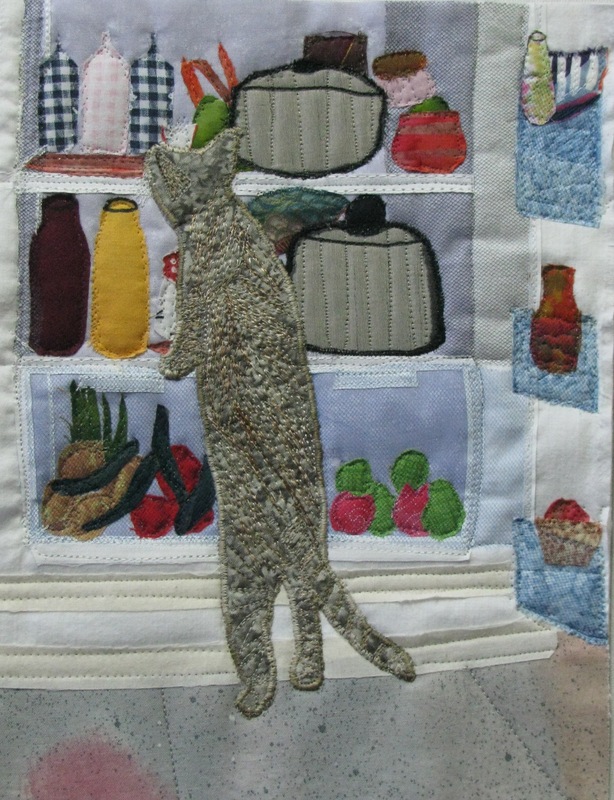 My faithful audience, aka my family, told me that the cat in the fridge was clearly the choice! 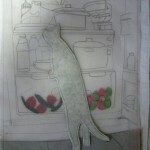 So, here are the next stages I’ve worked up of my cat-scape. The first is before quilting. I’ve made real strides to show the depth into the fridge. 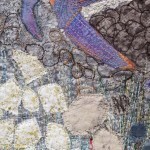 The second shot is after quilting. 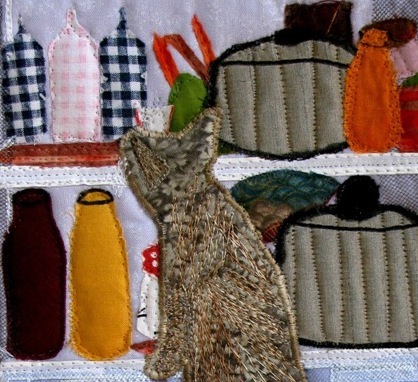 I chose not to do an enormous amount of thread painting, because I wanted the items in the fridge to be recognizable. 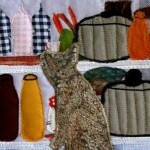 They are not artistic images; they are bottles of juice, containers of milk and pots. I’d be glad to hear what you think! 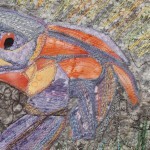 Do you see the three-dimensional quality of this work? Our fridge really looks this way. You can’t see the back! 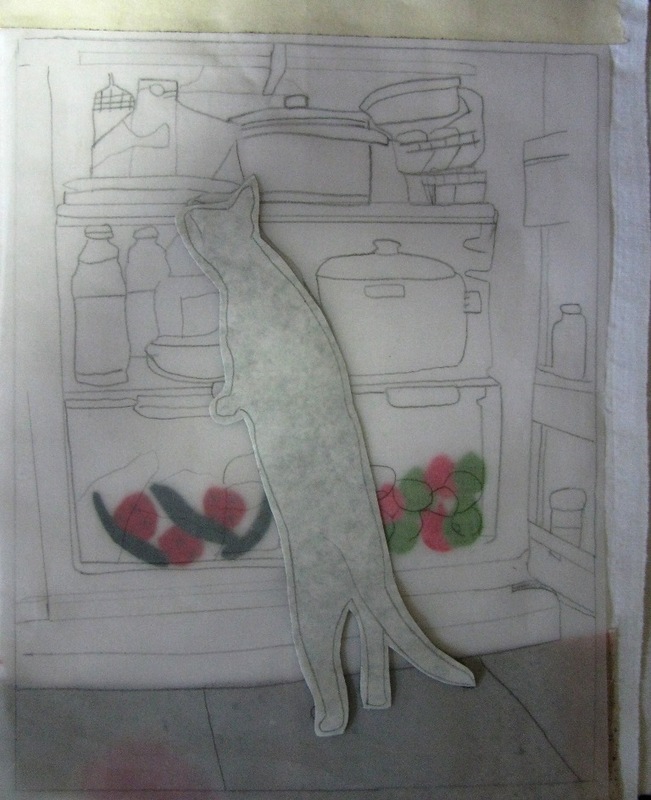 Here is the next step in my fridge landscape. I’ve traced the scene and I’m filling in the blanks under the tracing. It’s starting to shape up. More to come. 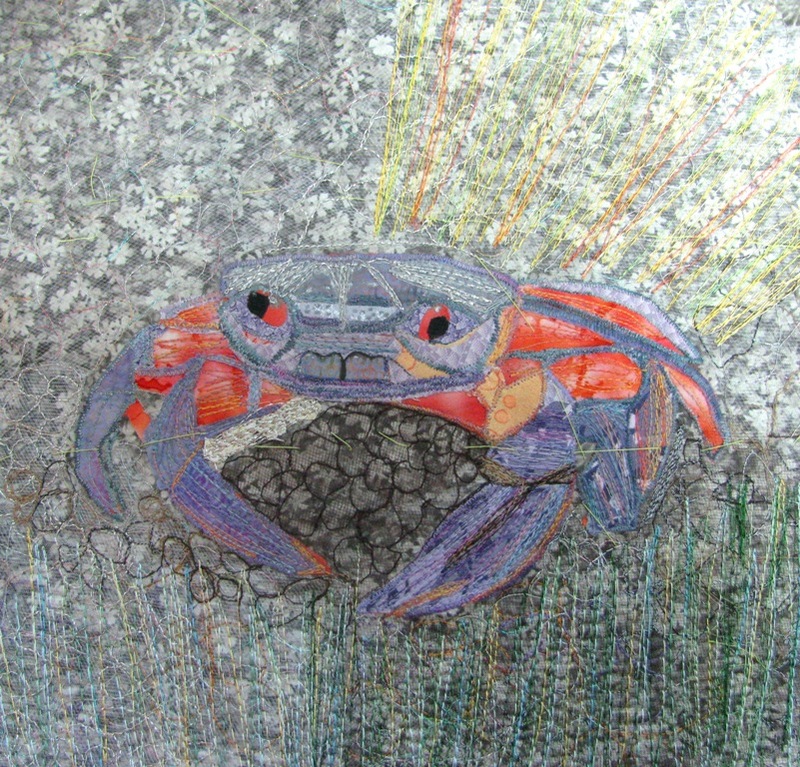 I mailed my Crab photos today. 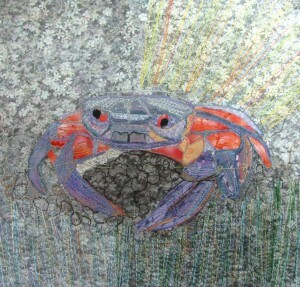 Maybe The Crab will be selected. Thanks to all who commented for your insight and help. January 21, 2011 the magazine will announce the finalists. 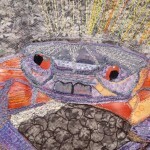 The thread painting is done and the quilting is completed. 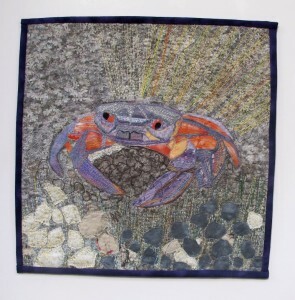 The binding is bound and… I finished the crab!!!! I will soon be sending off my photos. I hope my work is considered. We shall see… later in January. 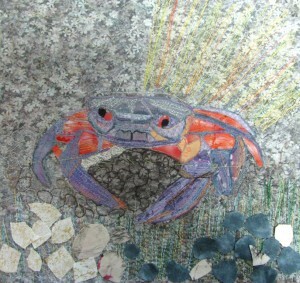 Ok, so the crab is in the shadows and the sun, but who took away the rocks? This time I went for grass and rocks. Here is the current result. I can show this without the rocks as well. Here goes. I still need to deal with the top, left corner. Looking forward to your thoughts.